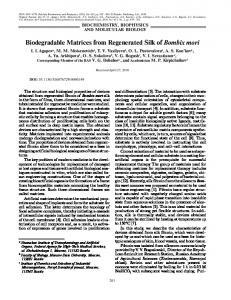 The structure and biological properties of devices obtained from regenerated fibroin of Bombix mori silk in the form of films, three dimensional matrices, and. Sep 22, 2011 - IntroDuctIon. Bombyx mori (silkworm) silk is a unique material, which has his- torically been highly regarded for its strength and luster. Jun 25, 2014 - generate electricity, could we harness this electricity for some ..... in the same way as the SCM does (Figure 14, Movie S9, Movie S10,. We thank to Sang-Woon Lee (Gangneung. Asan Hospital) for revising ... Rhyu, S. B. Han, and C. P. Chung, J. Biotechnol., 120, 327. (2005). 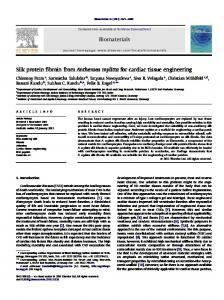 (12) G. H. Altman, F.
Abstract—The present study aims at the preparation of silk fibroin solution for possible applications in tissue engineering. Pure silk fibroin protein was extracted from Bombyx mori silk cocoon by degumming method using aqueous Na2CO3 solution followed by solubilizing in LiBr aqueous solution. 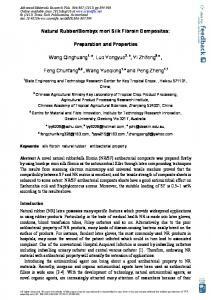 The fibroin protein solution was purified and studied for the protein content. The degumming & solubility were significantly dependent on the salt concentration, treatment temperature, and time. A salt concentration of 0.02 M Na2CO3, temperature of 80°C and time more than 40 min were found to be favorable degumming conditions. The proper conditions of dissolution were found as 9.3 M LiBr, 70 °C temperature, and 3 h dissolving time. The morphology of degummed silk were investigated by SEM at different magnification. 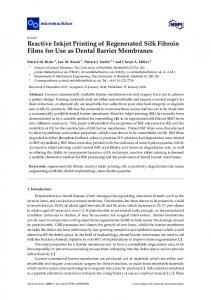 SEM revealed the absence of glue like sericine over the silk fibroin surface at optimal degumming condition. The fibroin protein content of the solution was measured by Bradford protein assay. 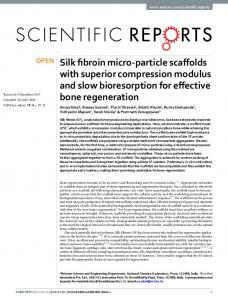 The results indicate that the regenerated silk fibroin (RSF) can be used for fabrication of porous silk fibroin scaffolds for various tissue engineering applications. Index Terms—Tissue engineering, scaffold, fibroin, SEM. attaching animal cells cultured in vitro, and was also important for maintaining cell function (Kim et al., 2005; Wu et al, 2000). For example, Wu et al randomly wound SF fibers to form net where animal chondrocytes were three-dimensionally cultured, and their results showed that SF could be used as good scaffolds for chondrocytes in three-dimensional culture. The silk fibroin fibers produced from silkworms at room temperature and from an aqueous solution are strong and stiff fibers, whereas synthetic materials with comparable properties must be processed at higher temperatures and from less benign solvents. 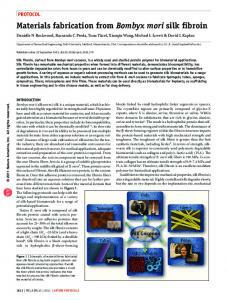 (Shao et al., 2002) Silk must be regenerated into a desirable form to meet a specific biomedical application. In general, aqueous SF solution is obtained by dissolving SF in the concentrated neutral salts, such as calcium chloride, lithium bromide, and so on (Yuji et al., 2005).To date, it is known that SF is soluble in certain high ionic-strength aqueous solutions of chaotropic salts, which destabilize proteins in solution and increase their solubility (Lizukar et al., 1985; Kweon et al., 2001) Many researchers have attempted to find suitable solvents for preparing SF solutions, which may be subsequently spun into fibers , however, very few literatures are available regarding the complete processing of silk ,optimization of process conditions and the characterization of silk solution. 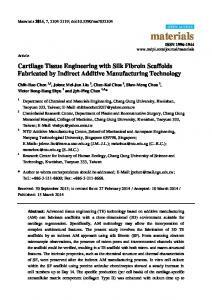 In this paper, the regenerated form of SF solution were prepared and characterized for tissue engineering application. II. MATERIALS & METHODS A. Materials Bombyx mori Silk cocoon were purchased from mulberry farms in Chittoor district, Hyderabad while analytical grade Lithium Bromide, Sodium Carbonate and chemicals for Bradford Assay were purchased from sigma company. B. Preparation of aqueous silk fibroin solution Dried Bombyx mori silk cocoons were cut into small pieces and treated with boiling aqueous solution of 0.02M sodium carbonate for 20 minutes with stirring. The whole mass was repeatedly washed with distilled water (Milli-Q water) to remove the glue-like sericine protein and dried in hot air oven. 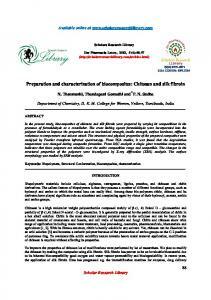 Silk fibroin solution was prepared by dissolving 10gms of degummed silk in9.3M LiBr solution at 70°C for 2½ hrs. The fibroin solution was dialyzed in a cellulose membrane based dialysis cassette (molecular cutoff 12,400.) against deionized water for 3 days, changing water every 6 hrs. in order to remove LiBr. After dialysis, silk fibroin solution was centrifuged at 5-10˚C and 9000 rpm for 20 min. The concentrated solutions were stored at 4 °C for further study. The protein concentration was then measured using Bradford standard assay procedure (Bradford, 1976). C. Degumming loss Degumming loss, which represents a quantitative evaluation of the degumming efficiency, indicates the weight loss of the fabric (expressed as a percentage of the initial weight) after degumming. Before weight measurement, samples were kept at 37◦C in hot air oven for 24 h. Degumming loss (%) = [(Initial Wt. of silk cocoon-Wt. 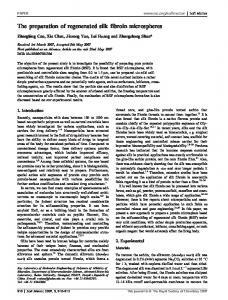 of silk fibroin recovered) / Initial Wt. of silk cocoon] x100 D. Measurement of protein concentration The fibroin protein concentration was measured by the Bradford protein assay procedure (Bradford et al., 1976). The fibroin solution was added to the Bradford reagent and incubated at 30°C for 5 min. and the absorbance at 595nm was measured .The Bradford assay relies on the binding of the dye Coomassie Blue G-250 to protein. Thus, the quantity of protein can be estimated by determining the amount of dye in the blue ionic form , usually achieved by measuring the absorbance of the solution at 595 nm. Bovine serum albumin was used as a standard protein. E. Scanning Electron Microscopy The morphology of degummed silk fibers were determined by SEM at different magnification. Assembled silk fibers were air-dried overnight and affixed via carbon tape to the SEM sample holders and vacuum-coated with a 20-nm layer of platinum. Specimens were observed on a JEOL JSM -6480LV SEM and photographed at a voltage of 15 kV and room temperature. sericin removal without triggering the hydrolytic degradation of fibres, which can be easily induced by the presence of harsh chemicals in the treatment bath. Initial sample of 10 gm of silk cocoon fibre ware taken for each study. 1) Effect of Na2Co3 salt concentration To study the effect of the aqueous sodium carbonate on the extent of sericin removal, the treatment time 60 min and temperature 70 C were kept constant, while the salt concentration was changed in the range 0.01-0.04 M. The effect of salt concentration on the preparation of silk fibers is shown in Figure1. From the experimental results it is observed that the amount of silk fiber sharply decreased with increase in salt concentration from 0.01 M to 0.02 M this is due to loss of most of the sericine from the silk fibre into the solution. The degumming loss increases from 19.9 % to 24.4 % in the concentration range of 0.01-0.02 M. The amount recovered is either decrease or shown no effect with further increase in salt concentration. However the maximum degumming loss of 25.4 % was achieved at concentration of 0.04 M when silk fibre of 7.46 gms was obtained.Concentration of 0.02 M when degumming loss approaches the complete loss of sericine from silk fibre was taken for further optimization of the process. The salt concentration was taken minimum to get the silk fibre in intact form since the more amount of harse chemical cause hydrolytic degradation of silk fibroin into solution.Also at the concentration of 0.02 M , the silk surface was found smoother as compared to higher concentration as revealed by SEM. Fig. 2. Effect of Na2Co3 salt concentration in degumming at 70 ºC for 60 minutes. Fig. 1. Extraction of fibroin protein from Bombyx mori silk cocoon. became shiny, soft, and scroopy. sericine and fibroin and more solubility of sericine into the solution. Moreover, the extension of the treatment time probably exposed sericin to the action of hydrolysis by salt. Fig. 3. 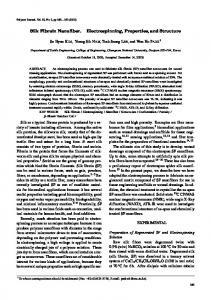 Effect of degumming time at 0.02 M Na2Co3 & 70 ºC. 3) Effect of degumming temperature To study the effect of the degumming temperature on the extent of sericin removal, the salt concentration of 0.02 M and treatment time of 60 min. were kept constant, while the temperature was changed in the range 60-90ºC. In fact, it is well known that sericin can be removed by using water alone, but high temperature is needed to attain complete degumming (110–120 ºC, under pressure). The temperature rise upto 60 ºC probably contributed to enhance the solubility of partially hydrolyzed sericin fractions adhering to the fibrous core of the silk. The rise in temperature from 60 to 70 C results into loss of most of the sericine from the sercicine with degumming loss of 24.4 %. Rise in temperature by 10 C results into degumming loss of 25.1 % followed by 25.5% at 90 C. The rise in temperature not only provide the activation energy for the breakdown of interlinking bonds but also increases the solubility of sericine into solution. Fig. 5. Scanning electron micrographs illustrating differently degummed cocoon silk morphologies. A) Degumming by 0.01 M Na2CO3 degumming silk, showing comparatively incomplete removal of gum. B) Degumming by 0.02 M Na2CO3 , appearing relatively smooth, and individual longitudinal strands were also clearly visible. C) Degumming by 0.03 M Na2CO3 , individual longitudinal strands were clearly visible. Fig. 4. Effect of treatment temperature at 0.02 M Na2Co3 for 60 min. 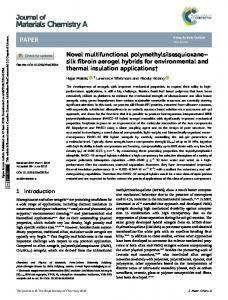 Effect of treatment time on solubilization of degummed silk fiber was studied at LiBr concentration of 9.3 M at 70 °C. The amount of silk fiber remained after the process was recovered, air-dried and weighed. The amount of protein concentration in silk fibroin solution was also measured using Bradford assay.The concentration is doesn’t change appreciable after 3 hrs. as shown in figure 8.
diameter so obtained is 10-12 µm. C. Preparation of regenerated silk fibroin aqueous solution The solubility of silk fibroin in ionic liquids depends on the identity of both the cation and anion, with the anion having a much larger effect. The more the cation and anion are able to participate in hydrogen bonding, the greater the solubility of the silk fibroin. (Dyme,1989) Presumably, the ionic liquid disrupts the hydrogen bonding present in the β-sheets. 1) Effect of temperature on dissolution of silk fiber The effect of temperature on solubility of protein is shown in figure 2. When treatment temperature increases from 50 °C to 60 °C , the protein concentration of solution increases appreciably. Dissolving the silk fiber in LiBr solution gave the better result at 70 °C rather than others one. At 70°C and 80°C all the silk fiber were melted while at 60°C silk fibers were not completely melted and it was very difficult to separate the solution through filtration. Fig. 8. 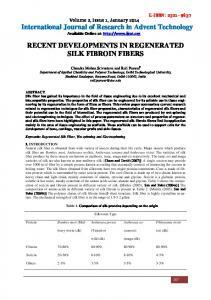 Effect of treatment time on dissolution of silk fibroin. 2) Effect of LiBr salt concentration The effect of LiBr salt concentration on solubility of protein is shown in figure 3.The amount of protein present is more at 9.3 M than others. So as the concentration of LiBr increases the solubility of protein also increases. At concentration of 9.1 M, protein concentration is 1.4 mg/ml that increases to 1.7 mg/ml at 9.3 M concentration. The increase in solubility is due to enhanced breaking of disulfide bonds between the heavy and light chains of silk fibroin. 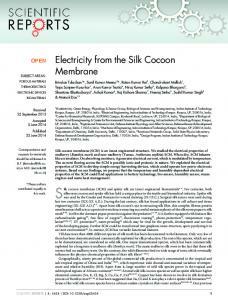 Report "Regenerated Silk Fibroin from B. mori Silk Cocoon for Tissue ..."